The A321LR has more range than the 737-8 when equipped with 3 aux tanks. Unfortunately that doesn’t leave cargo volume when flying shorter routes or weight for cargo when flying longer which is important for Icelandair. If you have to haul a lot of cargo, the 330 is your friend, which can be flown by the same group of pilots as the 320 family, just like their current 757/767 combo, while the 787 and the 737 are different pilot groups. Off topic: the name Icelandair is missing from the tails of the new 737's. Why is that? I know it is a first world problem, but it does annoy me quite much. Boston can’t help but get whacked. I can’t see the merged carrier retaining all those flights. This is going to "pop" a lot of planes. There are a lot of overlapping markets. There's no way they would have a low cost brand and the regular brand in the same market long term. I think you will see huge capacity cuts in overlapping USA markets. Europe may be more static. This likely means that markets like STL may return unless they park a bunch of planes. On the optimistic side, there is a lot of rationalization that could occur here. Put the larger WOW 330s on big market routes to free up 767s for longer thinner routes. Use 320s to serve shorter routes and add frequency and free up 757s for medium length routes. FI was going to need to replace a bunch of aircraft anyway, so this solves that issue in a big way, at least for several years. A big question to be answered is will the WOW routes be part of the same codeshare agreements as FI and if so, how soon will that take effect? The lack of codesharing was a major weakness IMO. The A320n and A330 are not a common type rating. Airlines can have pilots with multiple type ratings, but it is not very common. Keeping two ratings can end up costing quite a bit more than separate groups due to additional training. As a result of the merger, I wonder if Icelandair would move a bit more 'legacy' like offering free-meals on their 'near long haul' flights like Westcoast NA as to differentiate themselves from WOW's ULCC model especially on routes that overlap. You make a good point. If FI dumps the 757 it could soak up all those planes pretty quickly. I think you will see more widebodies on KEF-Europe. The top markets all suffered from a lack of connecting seats in both networks. They might use Primera a321neos. It would probably be cheaper to fly leased a321neo then old B757. Wow is probably going to Icelandair weapon for lcc competition. Can’t wait to see what is going to happen future Icelandair Group fleet plan, or they might even start using a319 on small demand European and NA routes. Remember Icelandair had advantage with two aircraft types. Now they have a320,a330,b737,B757,b767 and b787 in future. That’s a lot for major legacy carrier. I don't get this focus on KEF. Iceland is part of the EEA so their planes are free to fly anywhere within the EU or from Europe to the US and other markets with Open Skies like Israel or Morocco. This may be an opportunity for the Boeing 797, if launched in 2019. Aviation news of the day! As I understand this is not a merger, but a takeover. Maybe the topic title can be changed. Good to hear Icelandair plans on keeping the WOW brand, at least for now. The airline is still on my wish to fly list and this gives me some extra time. I do wonder however how soon we can expect the first route cut announcements. Remember that FI runs a pretty good leasing side business; I could see them leasing out excess capacity fairly quickly if need be. Wow will be consigned to history sooner rather than later. Both airlines were loss making as they were eating each other’s yield on similar routes. For bank operations, it makes sense to have one brand feeding one brand. Iceland doesn’t need two LCCs competing. Does anybody else see the potential problems of merging one financially challenged airline with another financially challenged ditto? The only reason for going via KEF when hopping across the pond, given the phalanx of direct options, is a lower price. At a price so low, one might argue, it's not possible to turn a profit? Icelandair ordering the latest 737 variant is the dumbest fleet decision of aviation history? Could you elaborate on that, please? I have heard stories of tiny bathrooms and minimal personal space for passengers compared to other aircraft types, but not what you state. Why are those aircraft so bad for Icelandair? Because the very nature of their operations requires maximum performance. It's no wonder the 757 was - and still is - the mainstay of their fleet. The further their narrowbodies can fly, the bigger market they can capture. The 320neo family offers to an Iceland-based airline much better growth opportunities than the 737. Also, they never had 737s in their fleet before, so there is no any commonality advantage. The A321LR has more range than the 737-8 when equipped with 3 aux tanks. Unfortunately that doesn’t leave cargo volume when flying shorter routes or weight for cargo when flying longer which is important for Icelandair. The 737-8 has been scheduled for routes up to 3200nm. That is marginally enough range for KEF-SEA. It will be interesting to see how this impacts the fleet. The A321neos are leased and 737a are owned. Airlines with poor credit like Wow tend not to get particularly favorable lease terms versus direct purchase airplanes. Ownership costs may favor keeping 737s. The A21N planes are leased, but so are the current B38Ms and the first three B39Ms due (2 JOLCOs and 4 sale-leasebacks). That said, the A330s will be interesting as now FI might have a busines case to buy or lease B789s (if buying, better finance terms). Given how small Iceland is, it’s hard for 2 scheduled domestic carriers to thrive. I really don't think many people saw this one coming. I suspect Icelandair are doing this deal with one hand jammed firmly up their backs by the Icelandic Government. I can only think WOW was about to cease trading and the Icelandic Government was very nervous about the impact on both jobs and tourism, so has "persuaded" Icelandair to take it on as the least bad option. I wonder where the payback for Icelandair will come, beyond removing a competitor with crazy pricing policies from its market. FI's main competition on price will now be Norwegian. There are many airports that FI/WW can serve with the 738 MAX/321neo that Norwegian can't touch from mainland Europe/Ireland/UK without needing to send a 787. As an example, here is a comparison of 3200nm @ KEF and EDI. That's huge swaths of the US where a 160-220 seat MAX/neo could work but a 290 seat 788 would be too much lift. Add in that FI has a hub at KEF to get people to Europe in a large hub model that Norwegian doesn't currently6offer and it becomes even more compelling. Makes me think of the acquisition of VX by the much larger AS. They could have operated them separately under the umbrella of Alaska Air Group but it's redundant to have to have two different groups for operational purposes, marketing, etc. The differences in fleet type bring opportunities for right-sizing routes and combining the two saves a ton of money on the back end. Will not be surprised a few months into this to hear they are merging WOW into FI. They had some 737-400s "back in the days"
And Icelandair ordered 15 737-800. They were leased out, both dry and wet and later sold. Icelandair did never use them on their own routes. The 737-800 were a special deal with Boeing, partly to cover that Boeing canceled the ordered 757-300. Can we expect FI getting rid of the 737s and switching to the 320 family? As much as the A321NEO is superior to the 737MAX, I just cant see it. The WOW fleet is a messy hodge-podge of all kinds of A32X variants. They only have 2 A321Ns. I would question the 767 fleet though, with 3 relatively new A330-300s, and another 4 A330-900s inbound at WOW. Anyway, congrats to the pilots and cabin crew, who can sleep a bit more comfortably in the old barracks at Keflavik tonight. I can't say that I'm really surprised by this. I don't really think there was enough room for two carriers operating in essentially the same space. They'll be able to offer a pretty competitive game as a combined entity. I think the end game will be all/most flights operated by Icelandair with a "WOW fare" option that is barebones. Yeah I get the feeling this is going to go the way of Air Canada and Tango where Tango ended up as a fare class. The government (which has recently accumulated a huge sum of unpaid landing and overdue fees on their balance sheet, no word on who might owe that amount) and the bank that had extended a line of credit to WOW. Keep in mind that the ripple effect on Iceland's cooling economy should WOW have spiraled to the ground and 35% of all available seats went away overnight with nothing to fill the void. No a trivial effect. And yes, not a merger, takeover. And it could be quite a mess to wind down. Somebody should get paid for taking the mess on. Last edited by Lapplander800 on Mon Nov 05, 2018 3:28 pm, edited 3 times in total. Why do you talk about Icelandair as a financial challenged airline? Good cash reserves and lots of equity. Yes they discussed with a lender changed conditions for a bond, as cash flow and profits did not match projections and had to declare that because they operate on the stock exchange. They had also to re evaluate and lower the guidance for expected profits this year. That does not make Icelandair Group a financial challenged company. Perhaps they were even discussing the changed situation with the bond holder in regards to buying WOW. Now Icelandair buys its main competitor, while he is still active and not bankrupt. The the deal is an stock exchange, so it does not touch the cash reserves of Icelandair. The disappearance of Primera Air also gives Icelandair a boost, as they had been competing on the market for chartered holiday flights. Not immediately challanged for sure. Solid underlying financials yet with unacceptable operational losses that could result in precarious situation that one should not be downplaying. In aviation, cash has a tendency of disappearing very quickly. Shrinking operations to rightsize is always harder than growing. The only reason for going via KEF when hopping across the pond, given the phalanx of direct options, is a lower price. Not true. Our family of five choose Icelandair for the journey to New York, because it gave us the opportunity to visit Iceland as well for a few days. At no additional airfare. I believe quite a few passengers appreciate this stopover option. Yeah, and taking over WOW should do a lot to solve those unacceptable operational losses. Their fleets couldn't be more different. IF this does go through expect some trimming of destinations. It'll be interesting to watch. I'd actually expect a trimming of capacity at destinations where they compete head on, with that capacity redeployed to a whole host of new destinations. Makes FI's building of a 2nd KEF bank in each direction a lot easier to achieve with this merger. And this is why KEF didn’t expand. Iceland doesn’t have the home population to profitably feed two hub airlines and subsidise the transit fares. Very few cities with many millions of pax do. LHR, FRA, CDG, AMS all have one hub carrier. Agreed. They can crunch the data from both carriers and right size existing overlapping markets such as BOS, JFK, ORD, DFW, YYZ, SFO, LGW, AMS, FRA etc. They can also optimize their hub banks in KEF much more easily now that they can play with slots at KEF over the whole day instead of being constrained to 6am-9am in the morning and 3pm-6pm in the afternoon. Interesting times ahead! I have also read articles that Iceland has had enough of mass tourism. I don't believe WOW air going under would have created big problems for the country. Before WOW was around Iceland was already well connected to Europe and North America courtesy of Icelandair. Less passengers actually sounds great for Keflavik Airport. Yep. 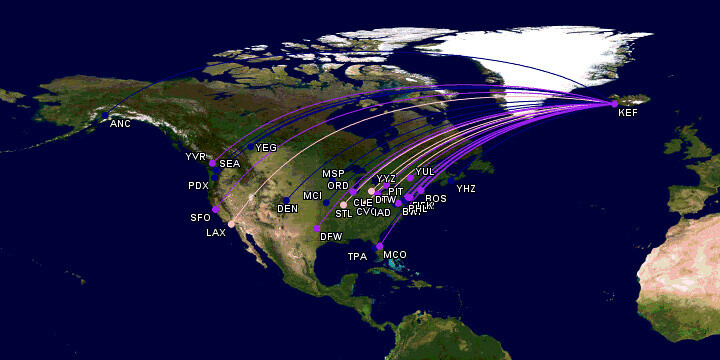 Just in Canada alone YQB, YOW and YWG spring to mind as possible new A320/7M8 destinations...maybe YHM too. The return of the likes of STL and CVG are also much greater as the FI/WOW combined network will have a much greater reach. I would imagine it'll take until summer 2020 for the big changes to occur. I expect that even if routes are trimmed, Icelandair will easily swallow the capacity. The frames and crew not used on Icelandair routes will be used for charter and wet lease operation. Of course there will be some cutting down. Icelandair was used to trim there crews down for winter operation in autumn and hire in the spring. This year Icelandair has already trimmend their crews for winter operation. Anyway, KEF has expanded and is expanding, but has not been keeping pace with the increase in passengers. This year the growth has been 13 % January to September. This deal will expand the possible connections offered. You will be able to connect between the two airlines in KEF. Last edited by mjoelnir on Mon Nov 05, 2018 4:10 pm, edited 1 time in total. Given how small Iceland is, it’s hard for 2 scheduled domestic carriers to thrive. Is it really about the size of Iceland? I thought it was about the size of Europe and North America. Icelandair and WOW are both aiming at connecting those two markets. And personally I wouldn't call them domestic airlines, but international airlines. Maybe home carriers would be a better description? Icelandair intends on buying WOW, but FI shareholder approval is required. Special AGM to be organised in the coming days. The two brands are to operate independent of each other. Do we who the shareholders are, Hedgefunds, pension funds,joe public, the mix is important to a yes vote. I put together some maps showing the combined reach of FI + WW. 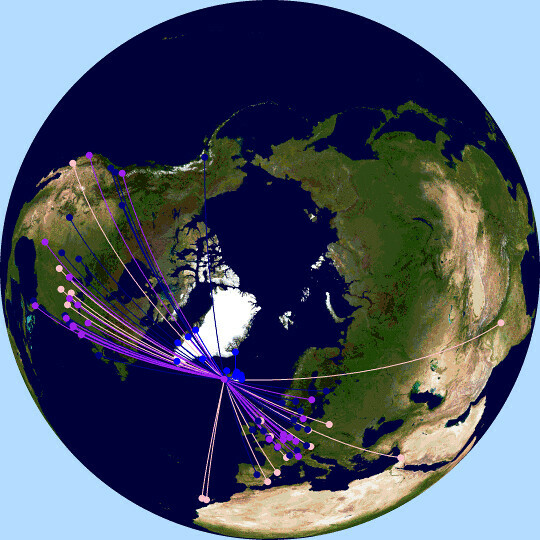 Navy are routes currently served by FI, pink are routes currently served by WW only and purple are routes served by both. Some of these routes are poised to be discontinued (KEF-STL, KEF-EDI and some others) but I decided to include them as the future outlook might change with today's news. Last edited by SRQKEF on Mon Nov 05, 2018 4:24 pm, edited 1 time in total. Why would FI do that? Isn't it easier to let them go bankrupt on their own? But they will get a funky new brand at a different position in the market where they can grow on new routes and supplement their own mainline routes. Or they will just slowly but surely wind down WOW to maintain the monopoly of a KEF hub. I just cant see Iceland Air running 2 separate airlines in the long run. Remember the Frontier and Midwest disaster Republic had? Granted it was a total different situation there, I just cant see a cost benefit by running two different brands. I see them combining and going with one name down the road. It would be interesting to see Iceland Air with some Airbus planes though! Looks like a distressed sale on the part of WW to me. Simplistic way of looking at it but WW had 20 aircraft, more than 1/2 of FI's 35 but will only get 5% of FI's equity. Overexpansion and rising fuel prices were going to do WW in on liquidity- Skuli chose to sell instead of going it alone and looking for more financing. 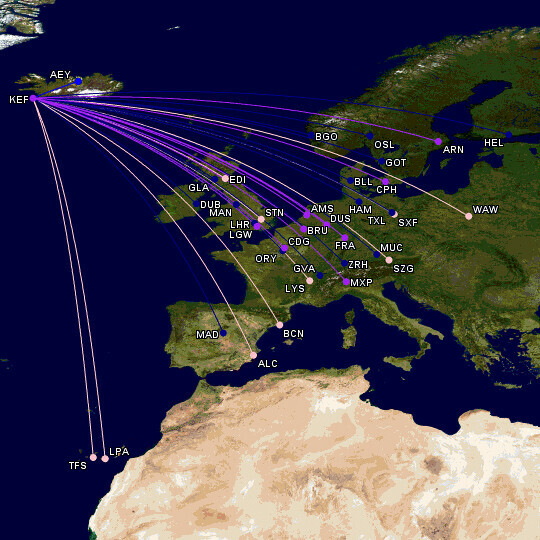 The days of 8 nightly flights from NYC-KEF are over (3 WW, 3 FI, 1 DL, 1 UA). Interesting the WOW was always saying DFW and JFK were seasonal but were never loaded because they are going to be operated by FI going forward. Since PIT isn't loaded past March in the WOW booking engine I would expect PIT to be taken over by an FI 737 in the short term but we shall see how this all works out in the coming days. I'd expect the 3 + 3 on WW and FI to be combined into 4 total max. Those other 2 will open up new routes. Not only the name. The 737 MAX unfortunately got a pretty low-budget version of the Icelandair scheme. No blue belly either. While the 757 and 767 look elegant, the 737 MAX look cheap. Congratulations to Icelandair and WOW. If they can make KEF transfers seamless, they can maximize the yields by picking the right carrier on a given route. Also, WW's part-time workforce is a major advantage.